Families have been drawn to the breathtaking mountain vistas and crystal clear waters of Lake Toxaway since 1903 when the Fords, Edisons, and Rockefellers came to the area by private railroad. Today, there is much to offer in Lake Toxaway real estate. 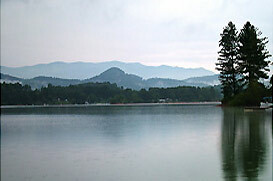 It is a premier resort destination offering rentals and second homes in several unique communities featuring the state’s largest private lake, country clubs, golf and tennis, great hiking and fishing, with homes and homesites on the lake, on the golf course, or on the mountain with dramatic mountain vistas. Minutes from Highlands, Cashiers, and Brevard, and an easy drive from Asheville, Atlanta, and Greenville, Lake Toxaway is a place where Mother Nature displays some of her best work, twelve months a year. In Lake Toxaway there is a neighborhood for every lifestyle. There is no such thing as a bad view at Lake Toxaway—it’s purely a matter of personal preference. Whether your taste leans to the lakeshore, to the golf course, or to long-range mountain views, each distinctive neighborhood offers a multitude of gracefully blended choices that are the Lake Toxaway estates community.